The Limb Infrared Monitor of the Stratosphere (LIMS) version 6 Level-2 data product consists of daily, geolocated, vertical profiles of temperature, geopotential height, and mixing ratios of ozone (O3), nitrogen dioxide (NO2), water vapor (H2O), and nitric acid (HNO3). Version 6 LIMS data have improved spatial resolution in both the vertical and along the orbital track, as well as improved accuracy and precision of measured geophysical parameters. The data files are in an ASCII text format and each data file is accompanied by three data screening files. 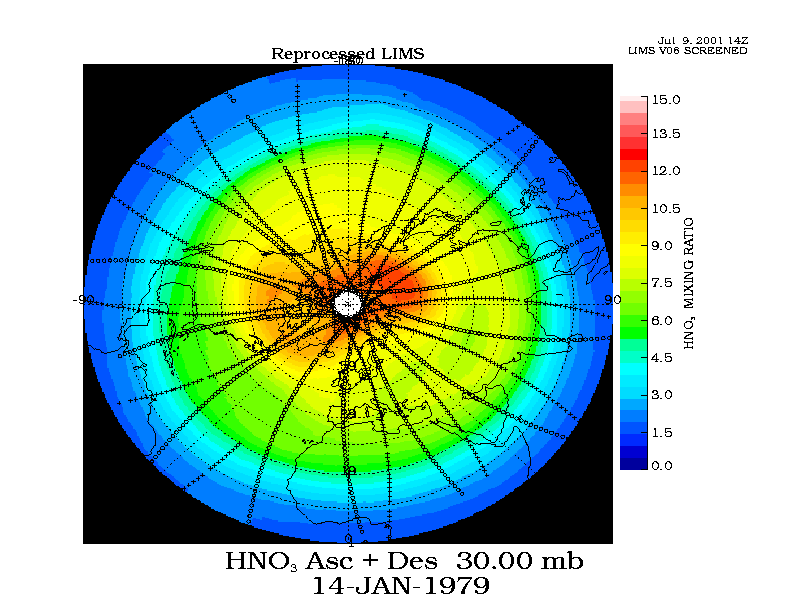 The LIMS instrument was launched on the Nimbus-7 satellite and was operational from 25 October 1978 until May 28, 1979. These data supersede the previous version 5 product, known as the LIMS Inverted Profile Archival Tape (LAIPAT). Consult the User's Guide and PI comments. Also check the data screening files that accompany each data file. J. of Quant. Spectrosc. Rad. Transf. J. Quant. Spectrosc. Rad. Trans. Created by: Remsberg, Ellis, et al.